For years I’ve heard that creativity ebbs and flows like the tide but I never really understood what that meant until I started recording my thoughts online. Most of the time, my head is full of ideas and plans to execute them. But sometimes they don’t fall into place as quickly and easily as I’d like. 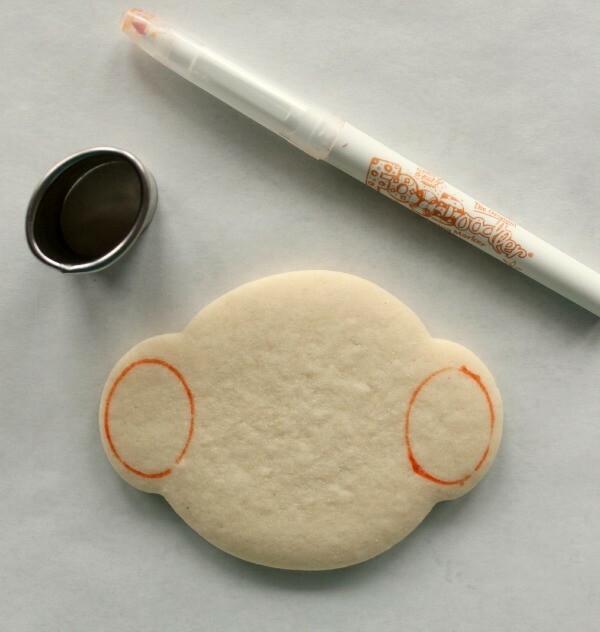 These snowman cookies are a perfect example. Believe it or not, they were inspired by a penguin hat that Old Navy carried a few years back. As soon as I saw it, I knew exactly what cutter I’d use. Except it didn’t come together like I’d planned, so when the season passed I tucked it into the “next year” box in my brain. Then next year came, and the next. And somewhere along the line my vision changed from penguins to a snowmen…but no matter how much I dreamed, I kept getting stuck. Then I saw Jill FCS’s latest (amazing) snowmen. Suddenly, I knew exactly how to make my vision come to life. While I pride myself on my original ideas, I am learning to appreciate the ebbs in the creative process. It helps me to remember the importance of having a muse and other creative friends to inspire me when my well runs a little dry. Instead of being afraid that I’ve lost something, I am learning to embrace the natural periods of rest that every creative person encounters at one time or another. After years of bending and and re-bending my Wilton monkey cutter, it was kind of mangled, but I stayed true to the original plan and made it work. 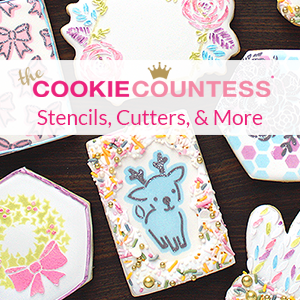 If you don’t have one, this monkey cutter will work, or, you can pick up this version from Whisked Away Cutters. To clean up the wonky curves, I used a food color marker and oval shaped cutter to map out the design before piping. This is a great alternative for people who don’t own or want to use a projector. Outline and fill the face portion of the snowman and let dry. This can take anywhere from four to twenty-four hours, depending on where you live. Next, use twenty-second icing to flood the earmuffs. Let the icing set for a few minutes, then lightly sprinkle with sanding sugar, being careful not to over-sprinkle. This can cause cratering. While we’re on the subject, let’s talk about this nose. I call it the Olaf. Since his breakout role in Disney’s “Frozen”, snowmen noses have never been the same. It’s kinda like what Jennifer Aniston’s hair was to the nineties. If you know what I’m talking about, nod in agreement, if not…nod and smile anyway. In any case, I have a feeling that all the stylish snowmen (and women) will be sporting the Olaf for years to come. 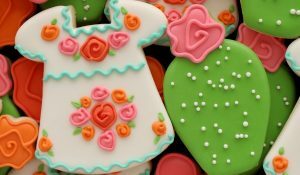 These are great on their own, but I like to mix in few simple “filler” cookies for a pop of color. Super adorable! Have you stopped posting on Youtube? 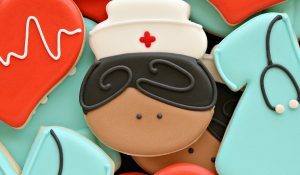 These cookies are so cute and fun!!! SO CUTE! I love these little guys (and also the Jennifer Aniston remark). I was particularly struck, though, with your comment about the ebb & flow of creativity. 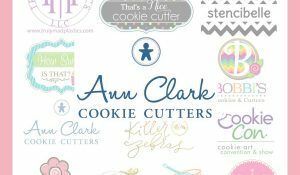 As an artistic person, I find that my creativity moves from one place to another quite frequently; cookies, cake, knitting, music… From one day to the next Creativity shifts, and that’s a good thing! Art feeds art, regardless of how it’s expressed, and I bet if you look you’ll see your creativity might have just moved over to parenting for a bit, or maybe to home decor… I know you; you couldn’t stop being creative if you tried! 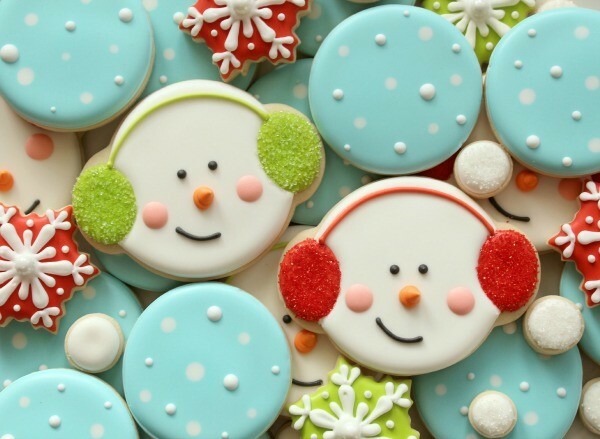 These are the most gorgeous snowman cookies I have ever seen! I made some snowmen for Christmas just gone, but I was unhappy with the shape and the decorating options. I also made some Mrs. Claus cookies out of the same snowman cutter (upside down, of course!) and everyone agreed they were waaaay better than the snowmen. 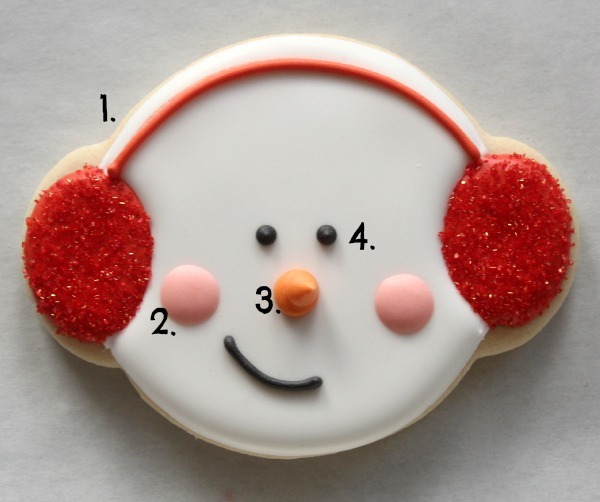 The little heads and earmuffs are so adorable, and take away all the bother of trying to get the shape just so. Gorgeous! I love these guys! 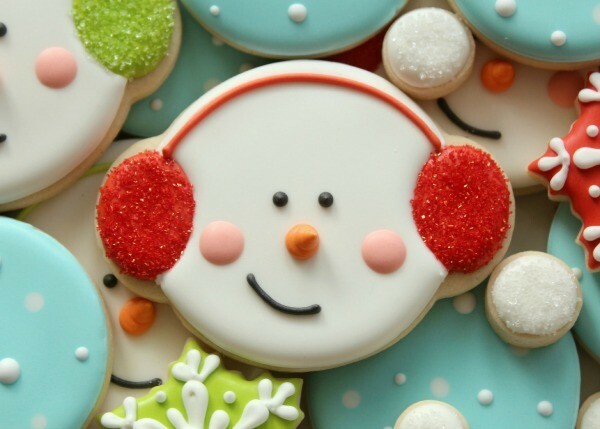 And on the platter with those clever snowfall cookies….so adorable! How cute is that?!! Love it! Pretty sure my boys wore those pajamas!!!! Love that little snowman guy! That whole creativity ebbing and flowing thing really makes sense. And it makes me feel better about starting a blog post with “So…” and then not writing anything else for just hours. And these bright sparkly snowmen just make me happy! Your combination of cookies is nothing short of perfection. I love the simple adorable-ness of these cookies. Super cute! Your cookies always inspire! This snow man is fantastic and I was nodding in agreement about the Olaf and Jen haircut! hahaha, funny!!!!!! 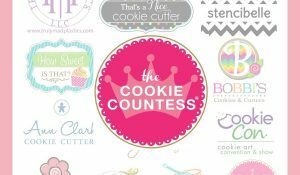 You’re “cookie think” is awesome and having your muse get inspiration from other creative people is what all of us do with your designs daily!!!!!!!!!! Thanks for sharing and always being interesting, kind and talented! “Yes!” When I saw the first line of this post in my reader, that “yes” was my thought. Because I have pieces to write for work, I find that I expect creative moments more than I appreciate them. That leads to frustration when the creativity ebbs, so I’m working on that. Also, lovely cookies. It may have taken a while for them to come together from that initial idea, but they look like they were worth the wait! 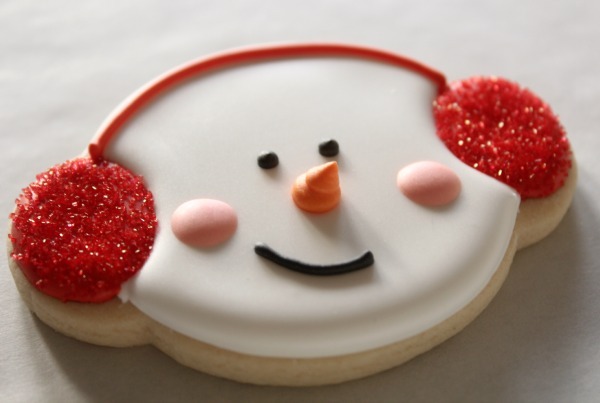 do you happen to sell and ship these cute, cute cookies, they would be perfect a Holiday Party I am hosting. I am making these as we “speak”! What color green did you use? I love the color combo!